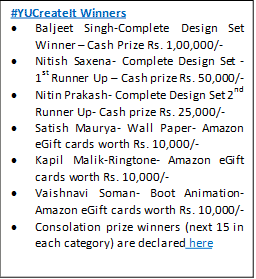 YU, the new age technology brand, today announced the winners of its campaign#YUCreateIt aimed at seeking creative inputs from YU fans and users to contribute wallpapers, ringtones, animations and themes. Started on 23rd April, 2015, the campaign empowered the consumers by giving them freedom to create their own technology experience. More than 2,000 enthusiastic fans participated in the contest, and gave life to the device as the company received more than 1500 entries for Wallpapers, 150 entries for Boot animations, 250 entries for Complete Design and 250 entries for ringtones. In the phase 1, the company will work closely with the winners of #YUCreateIt campaign to integrate their submissions on the Cyanogen Theme Store. These themes will be uploaded on the Cyanogen Theme Store soon and will be available for the users to download there. The winners will be promoted and acknowledged on YU’s social channels which have a combined reach of more than 4.5 lac followers and on the forums – which is a highly evolved tech community of more than 55k enthusiasts and on the YUPLAYGOD website. To give a unique identity to the creation of the winners of #YUCreateIt campaign, their name will also appear in Cyanogen Theme Store under their theme names as the name of the creator/developer. 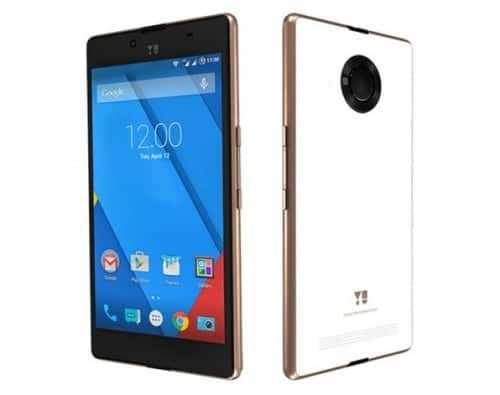 YU will reward the contributions for the top entries with prizes worth INR 5 lacs. The creators of the top three winning themes would be bestowed with a prize money of INR 1,00,000, INR 50,000 and INR 25,000 respectively along with a new device. This was the first of its kind campaign, which attracted an enormous number of developers to showcase their skills in the field of software development.